CIA Employee: Mr. Director, this is Agent Vivien Delay. CIA Employee: For the last ten years the Central Intelligence Agency has been after Wolfgang Braun. CIA Employee: As you know, we have no positive identification of what the Wolf looks like. What we do know is he's a former German national who sells atomic material to terrorists all over the world. CIA Employee: Intelligence confirms that a transaction is to take place next week in Belgrade. Q: What different versions of the film exist? Continuing my plan to watch every movie in Kevin Costner's filmography in order I come to 2014's three days to kill. Plot In A Paragraph: Ethan Renner (KC) an estranged father, with limited time to live, desperately tries to reconnect with his estranged wife and daughter before his death. Oh and he is a C.I.A. field agent, that is promised an experimental drug if he agrees to one last job. 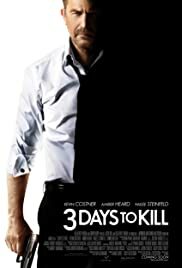 3 Days To Kill was marketed as an action film like Taken. I guess, that is a fair description. But there is more to it than that!! It is also an melodrama mixed in with foreign intrigue, assassination plots, kidnappings, and murders. There is plenty going on. Maybe it would have been better in Luc Besson's directed his own script, as it seems uneven at times. Ridiculously implausible, but that doesn't take away from its entertainment value at times. There is a silly sub-plot about a squatting family of immigrants who have taken shelter in KC's flat, but the distraction is minimal. The annoying daughters bratty attitude grows tiresome early on (I actually wanted several horrible fates to befall her) but she is worth protection by the ended the movie. With the exception of 3000 Miles To Graceland, 3 Days To Kill is without doubt the most action packed/violent movie in KC's filmography.